"Yes, they let women do some things at NASA, Mr. Johnson. And it's not because we wear skirts, it's because we wear glasses." That's a great quote from Taraji P. Henson in Hidden Figures, one of the year's best films. 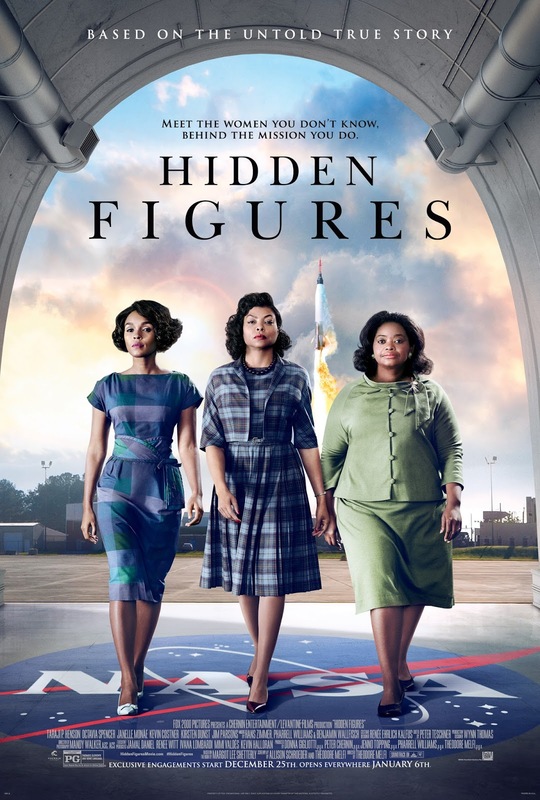 The film is based on the 2016 book Hidden Figures by Margot Lee Schetterly, based on the true story about Katherine Johnson, Dorothy Vaughan & Mary Jackson, 3 African-American women who helped NASA catch up in the Space Race & helped John Glenn become the first astronaut to orbit Earth. Henson plays Katherine Johnson, a mathematician working at the all-female African-American West Computing Group at NASA in 1961. Working with her are Dorothy Vaughan (played by Octavia Spencer) & Mary Jackson (played by Janelle Monáe). NASA is working extremely hard to catch up with the Soviet Union in the Space Race, so Katherine is promoted to work with the Space Task Group, led by Al Harrison (played by Kevin Costner). Tensions rise between Katherine & the employees, especially engineer Paul Stafford (played by Jim Parsons). Also, Dorothy faces discrimination from Vivian Mitchell (played by Kirsten Dunst), who offers little help to get Dorothy promoted to supervisor. Around this time, the Friendship 7 rocket, led by John Glenn (played by Glen Powell) is about to launch. This will be the first time that a man will orbit the Earth. It is now up to NASA, & especially Katherine, Dorothy, & Mary, to calculate the math, send him into space, & safely get him back to Earth at the end of his orbit. The cast is spectacular. Theodore Melfi's direction is amazing. Melfi & Allison Schroeder's screenplay is brilliant. The cinematography by Mandy Walker is astounding. The film editing by Peter Teschner is excellent. The costume design by Renee Ehrlich Kaufus is beautiful. The production design by Wynn Thomas is beautiful. And the film score & original songs by Benjamin Wallfisch, Pharrell Williams & Hans Zimmer are excellent. This is truly one of the year's best films. Mr. Bill says that he and Mrs. Bill will probably go see this movie based on your glowing review when they are down south escaping the never ending snow in Michigan. Well done, Cameron! (Mr. Bill).